Juno’s Science – What do we hope to learn? Future blog entries will look at specific examples of the science being done at the University of Leicester that is related to Juno’s exploration of Jupiter. But to set this work in context, today we’ll briefly summarise the overarching goals of the Juno mission, the experiments on board, and what we hope to learn from hurling this spacecraft into the unknown. 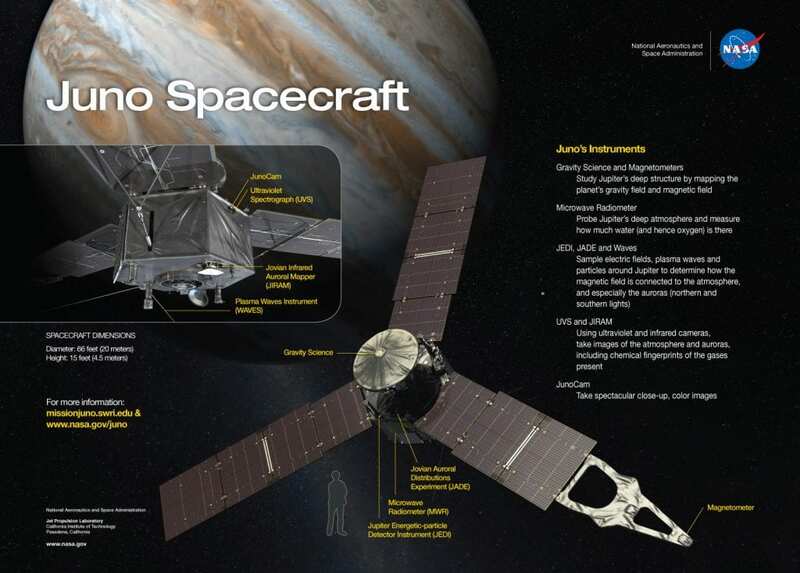 More detailed information can be found on the Mission Juno website (www.missionjuno.swri.edu). Juno aims to go right back to the beginning, to understand how the formation and evolution of Jupiter might have influenced the development of our planetary system. It will map the magnetic and gravitational fields of the planet to understand the interior structure and, possibly, reveal the presence of a solid core. 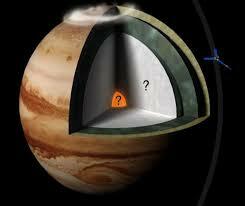 Given that the most favoured theory of Jupiter’s origin involves the accretion of a ‘proto-planet’ (a massive rock/ice object) before hydrogen and helium gas collapsed onto it, measurements of the internal structure hold the key to establishing whether this scenario is the right one, or whether we need to return to the drawing board. In addition, Jupiter’s composition was shaped during its early formation, with many of the ‘heavier’ elements (like nitrogen, carbon, oxygen, sulphur and phosphorus) expected to be delivered trapped in ices of water. Juno’s microwave radiometer will be able to measure Jupiter’s water abundance deep below the observable clouds to assess whether this theory is valid. Through microwave remote sensing and gravity mapping, Juno should reveal the interior structure and bulk composition of Jupiter to constrain our theories for how the giant planet formed in the first place. Juno’s gravity mapping will unlock the secrets of Jupiter’s interior. Juno’s suite of instruments also paves the way for new discoveries in its atmosphere and magnetosphere. Remote sensing instruments in the microwave (MWR), near-infrared (JIRAM), visible (JunoCAM) and ultraviolet spectrum (UVS) will allow researchers to piece together a 3D picture of Jupiter’s atmosphere, where all of the main cloud decks and weather phenomena reside. Crucially, the microwave instrument can probe the distribution of ammonia and water (two key cloud-forming species) at depths well below the top-most clouds for the very first time, to see what’s driving all the complex variability we see. Juno will reveal Jupiter’s polar atmosphere like never before, allowing us to assess whether it hosts a polar vortex like Saturn, or some equally strange dynamical phenomenon. Furthermore, Juno’s unique orbit will allow it to access the charged environments and magnetic fields above Jupiter’s poles for the first time. Juno carries a magnetometer (MAG), plasma and energetic particle detectors (JADE and JEDI) and radio and plasma wave experiment (Waves) to sample this environment in situ. The unique vantage point will allow the ultraviolet and near-infrared instruments to observe the powerful auroras that result from the magnetic field sending charged particles crashing into the planet’s upper atmosphere, creating the brightest auroral emissions of any planet in our solar system. Taken together, Juno’s study of Jupiter’s interior structure, atmosphere and magnetosphere will permit a comprehensive characterisation of this archetypal giant planet like never before. It’s also interesting to note what Juno won’t be doing – it will not be conducting any exploration of the satellites and rings, apart from brief glimpses early in the mission. Exploration of Io, Europa, Ganymede and Callisto must wait for the next big missions to Jupiter in the 2030s. The Juno spacecraft is the first solar-powered mission to travel as far as Jupiter, where the energy from sunlight is 25 times lower than that received by a solar panel at Earth. We’ve not done it before, because the technology for the development of efficient solar panels hasn’t been available to us. But the solar panels are still big (8.9 metres long and 2.7 metres wide) and there are three of them, creating a spacecraft diameter of 20 metres. And it is spinning at three rotations per minute, sweeping the plasma-sensing instruments and remote sensing fields-of-view over the planet. That means reconstruction of mosaics from lots of successive images is a challenge, but one that experts in image processing are rising to – the images of Earth from the Juno flyby in October 2013 were spectacular, and whet the appetite for what is still to come. In the next blog post, we’ll explain how the University of Leicester came to be involved in this exciting NASA mission.